This series has been taking a look back at #1 draft picks since the draft’s inception in 1963, their careers on the ice and after they hung up their skates. Links to the previous decades are at the bottom of this post, but for now, let’s tackle the 1980s. Beginning in 1980, any player who is between the ages of 18 and 20 is eligible to be drafted. In addition, any non-North American player over the age of 20 can be selected. From 1987 through 1991, 18 and 19-year-old players could only be drafted in the first three rounds unless they met another criterion of experience which required them to have played in major junior, U.S. college and high school, or European hockey. No Millionaires sweaters from 1915 are known to have survived. Cyclone’s mannequin is actually wearing an old Ottawa Senators sweater—the team the Millionaires beat to win the Stanley Cup. This has bothered local hard-rock singer Thor for years. Thor is such a hard-core Millionaires fan, he copyrighted the name a few years ago and has been reproducing Millionaires merchandise. 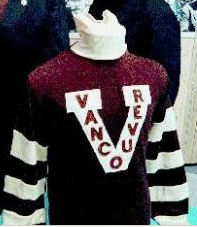 Now he has produced a replica of the 1915 Millionaires sweater, which he will present to the BC Sports Hall of Fame May 1, so that the Cyclone can be shown in the proper duds. When he says a replica, he means it. The sweater is made from wool, just like in the old days, and has the 1915 “V” logo, which Thor’s wife Kathryn painstakingly studied and reproduced from old photos. Back in March, my friend Miss 604 provided some interesting biographical information about Fred “Cyclone” Taylor, whose display at the BC Sports Hall of Fame will feature the replica soon.